In the wake of the government shutdown, The American Legion went public to assist active duty Coast Guard members through National’s Temporary Financial Assistance program. This program requires families with minor children. The Department of Florida utilized it’s program, Project: VetRelief, to provide assistance to those that did not have qualifying children. 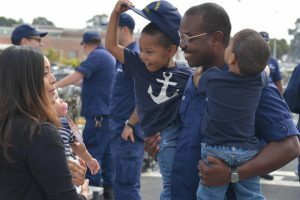 Through both programs, the Department Staff processed nearly 400 applications received from Coast Guard members. The wave of US Coast Guard member applications has been overwhelming, but we are happy to report that all cases in which there was not a minor child in the home have been provided with a $250 gift card to Publix from PROJECT: VetRelief. To date, there have been 29 Coast Guard members funded for a total of $7,250. Additionally, of the 302 applications submitted to National’s TFA program, 231 families were provided support for a total of $130,000. In the event that the government shuts down in a couple of weeks, the Department Staff would like to keep providing support for those effected for as long as we can; however, funds for both programs are limited. We ask that you, along with the members of your Post, take a minute to realize the impact a donation can have on someone defending your coastline and not receiving a paycheck.